Can you consider your roots without considering your family? I don’t think so. I do understand that perhaps not everyone has family in the most traditional sense, but even those people find themselves family where it works best. I am blessed with some of the best family around, I am convinced of it! I think my brother and I and all my cousins tend to be happy, well adjusted, successful people not just because of our parents, but because of our family as a whole. I wrote a bit about the “farm” in my trees post, but the farm was about ever so much more than just trees. This is where the familial relationships took root and developed and were tended. It seems a bit odd to say that this is where we “got to know each other” because it doesn’t seem that family gets to know each other like we do with other relationships in our lives. But yet there is an element of that. One of the reasons that having the “farm” sold was so incredibly difficult for me had nothing whatsoever to do with the land itself. There was that element, as that place had become a symbol of happy and simpler times for my generation. But that wasn’t all of it. It had more to do with how the family relationships were tended to there. The wide land gave us space and brought us together. How could I not be emotional over such a thing as this? How could we continue to tend the relationships that we planted there without the land? And strangely, by the time the land was sold, we were not using it in the ways that I grew up with, it was a moot point, I just didn’t realize that at the time. I am not saying that giving up that land was easy for me. But what I realized over the next couple years was that my parents generation was not giving up on us as I had supposed. They weren’t giving up on the relationships that took root there, it was just time to move them to another space. In the years that the decision was made to give up the farm, and the years following the selling of it, I came to realize that I would receive more support than I could ever imagine from my parents generation and this would absolutely have nothing to do with where anyone was living at the time. And now I see that we have yet another lovely and wonderful place where all these relationships come together and are cultivated. There is another place that has come to represent all that the farm meant to me. A place I long to be near even though I can only be there maybe once a year, and that longing has little to do with homes or the yards or the trees there, and everything to do with this strong desire to get back to my family relationships and harvest all the knowledge I can gain in the time I am there. I feel wrapped in the comfort of strong people with strong opinions and wonderful intelligence whom I have known all my life. I love to watch the generations, even the newest, sit together and play together and laugh heartily. We have the opportunity to continue tending those relationships in a new place, and that is so precious to me. So this is a great big hug and a thank you to my parents generation which has faithfully tended and supported and cared and infused knowledge and so many many more things on my generation of family. We may not get the chance to say it, but we feel more confident and content and at peace than you even know, and this has everything to do with your hard work! I find that everywhere I go I am making new roots. To me, I find this to be one of the most stressful things to do. Yet if I look back on the places I have lived, it is the places where I actively cultivated friendships and developed ties to an area that I remember with the most fondness. With all the turmoil that happened in my life around the time I moved to this city, some of that friendship development sort of got put on a back burner. It wasn’t that I failed to make friends, no, I did have various groups of supportive people around me, but except for my 2 favorite coworkers, none of them became particularly long term friendships. This might be, in part, because I am a notoriously “bad” friend. I don’t call people on the phone. I often don’t return phone calls. I may not seek out blocks of time to spend with you, preferring the relative solitude of my own home. I will forget your birthday and your anniversary and your children’s birthdays. I won’t even send a card. See? I am kind of an unusual friend. Of course on the other hand, when we do spend time together, I will listen to your stories and I will remember them, I will give you my thoughts on a subject if you ask for them, and I will be supportive of your decisions even if they wouldn’t be what I chose to do. I will do my level best to not get defensive when you tell me something I don’t want to hear but is true. So there is some sort of disconnect between the the surface actions that make people feel special and the deeper actions of friends that some people find disconcerting about me. About a year ago, I had the great privilege of meeting 4 other women around my age who all shared a common hobby with me. These 4 lovely women had know each other for awhile, yet they welcomed me in and I quickly felt a common bond even with all our collective uniqueness. What I enjoy the most about them is that since each of them is confident and successful and has their own life, there is none of the neediness that has gone on in past friendships I have had. Each is free to do their own thing and spend time together when warranted. So now I get to put down some roots in this city where I am now and I get to enjoy and celebrate the good parts of life with 4 women whom I admire and respect. One of these gals wrote a wonderful roots themed post which I loved and thought was very astute. Enjoy, if you will, Not your grandma’s theology, from Square Peg in a Round Hole. And I must add, I am finding it desperately difficult not to post knitting content. I feel that you are all in for it when this week is up! The order that I helped with is up at the loopy ewe. 2 pages start here. 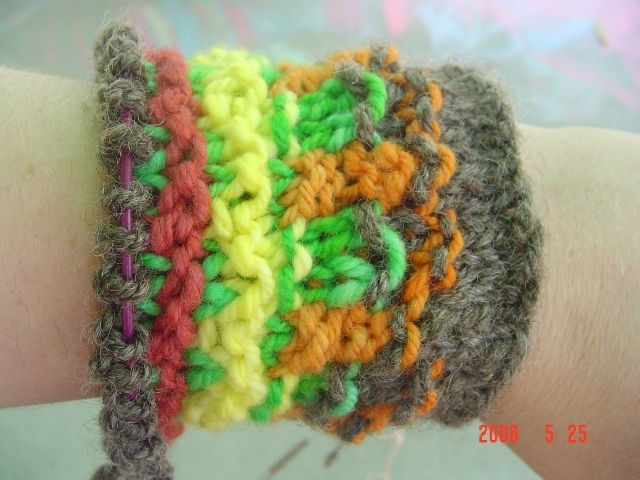 When I first saw the pattern for the Francie sock, I was immediately drawn to it as a pattern. I instantaneously wanted to knit them for J because it seems that all his childhood memories (at least the ones he chooses to share) are tree related. He talks of olive orchards and olive trees thousands of years old, which is awfully hard for this American gal to even comprehend. He remembers climbing lemon trees to get not quite ripe lemons to share with his sister as a nice hot summer treat. And he speaks of drinking tea underneath jasmine trees in full bloom. His tree related memories paint such a beautiful picture of his country that it makes me think that it should be a little piece of heaven on earth. Then I began to think about why his tree related memories connect with me. If we don’t have the shared love of trees, then would I connect so well with his stories? So I got to thinking about my own tree related memories. I thought about the “farm” where I grew up. I remembered the “pines” where hemlock trees made a cool copse even on the hottest days of summer. The hemlock needles created a soft carpet over the ground and there was a stream running through the middle of it all. Many days were spent there in all fashion of play and rest, with family and in solitude. Or the tree on the hill where there was tied a massive rope which dad brought home from the navy (I think this was the case, correct me if I am wrong dad!) We grew up swinging on that rope, pushing each other and eventually growing old enough and adventurous enough to climb into a nearby tree and swing out of it on the rope. All the while listening for the cowbell that indicated lunch or dinner time when we would run sure footed back down the hill and to the house. We didn’t live on the “farm” for long but we went back often, so many memories were made there. How about the cherry tree that I used to climb with a book when wanting a bit of solitude during my young teen years? And I’ll never forget the deep sadness I had when they tore up the trees that lined main street in the small village I lived in to make room for wider roads and “progress.” I walked to and from school under those trees and it was the first realization I had that things happened that I didn’t like whatsoever and I had no control over them. An awakening of youth perhaps. I was maybe in 4th grade? It is clear to me why we use the term “roots” to describe the collection of our own memories and the stories of our ancestors. For me, trees have very tangible memories attached to them, and somehow I feel that connection with J even though we grew up in different places, times, and cultures. With this in mind, I am interested in hearing your “trees make roots” stories, if J and I could connect this way, surely there are more stories to share! I know I have a fairly diverse group reading and I am wondering just how able we will be to write down some of our favorite memories. Also, if you really don’t have tree related memories, I want to hear that too! In fact, I want to know what you might find to be the equivalent connector for you. What is it in nature, or not in nature, that you associate your best memories with? Instead, we are going to have a roots themed week at Suzy Sells. I’ll post some things that have been on my mind, and I may just ask from stories from readers as well. So bear with me as we explore some of the things that make us who we are this week! I am rather excited to play around with these reflections and I hope that you will also enjoy the journey. I’ve begun the lite lopi sleeve, and added corresponding colorwork to it. The rest will be plain coopworth, but I am stretching it as far as it will go. To be honest, I am not sure how much I like it and I may rip it back and just do plain coopworth, I have yet to decide. 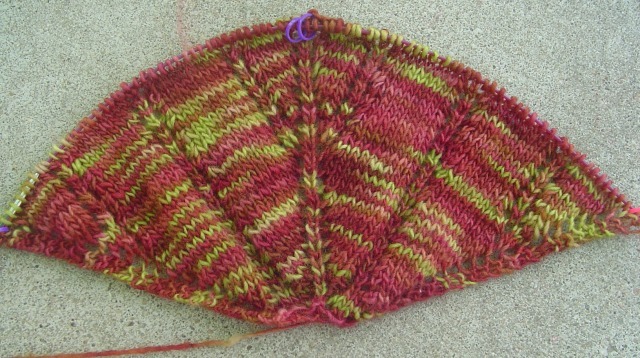 I also started the icarus shawl. J is coming home on Sunday. I wanted to have a little more for him than a pair of socks. I had bought him something else online, but when it arrived it became clear it wouldn’t work as a gift so I sent it back. I thought perhaps I could finish the francies for him, but that would be a lot of uninterrupted knitting and I have spinning to do and regular life to attend to this weekend. Clearly I was going to have to come up with something else. 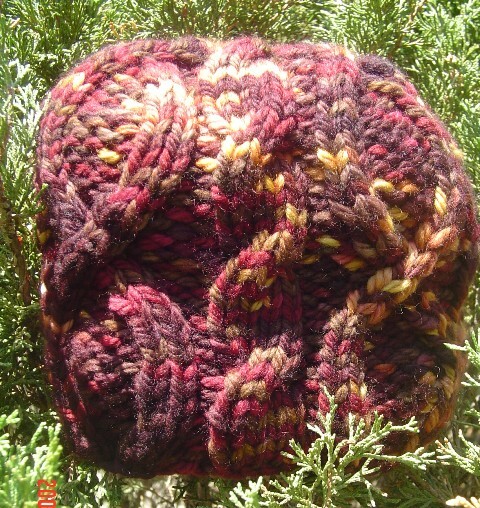 I ran across the unoriginal hat by yarn harlot. I considered it, weighed the fact that it was a chunky yarn and would knit up quickly against the fact that I would have to revamp the project to fit his head. 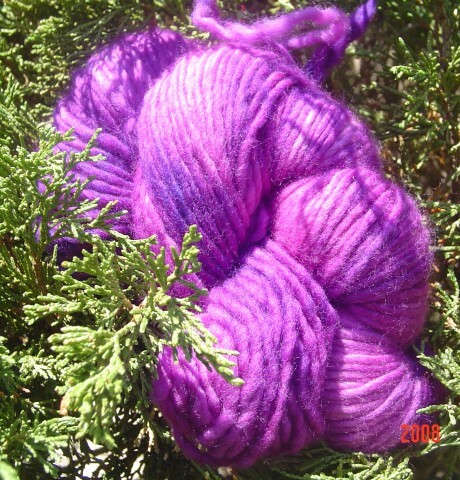 I decided to run into my LYS and see what they had. I walked out with malabrigo chunky, 2 skeins of the same color in case it took more than anticipated to knit the hat with my modifications. Low and behold it was on sale! I totally wasn’t expecting that. Apparently I chose a discontinued colorway. I knit the hat last night. I added another cable repeat to it and it should fit just fine. I love it, looks great on me too. So today the Bug and I ran errands. We went to the auto parts store and got a headlight and airfilter, she watched, enchanted, as the service guy installed the headlight. We went to the library to return books, then down to the farmers market. We bought honey and tomatoes and the BIGGEST BEST green onions you ever did see. Then I got the brilliant idea to exchange the second skein of yarn for another discontinued colorway, so that the hat I had decided to make for myself would not match J’s hat, because we just aren’t cutesy like that. 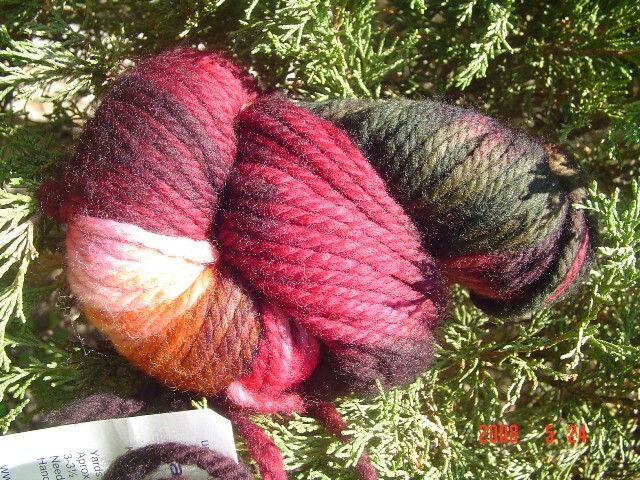 And little miss Bug who is as bad a yarnie as I am fell in love with both the koigu and the malabrigo. I swear, I did not lead her to these yarns myself, but instead just lead her away from the “sparkley” yarns. She picked out a little something for a hat for herself. She also wants a headband. I am thinking I can modify the chunky hat pattern to accommodate her head, and then also make some variation on the calorimetry to fit her. She was so excited about the yarns that she swifted them all by herself. I swear she never finishes an entire skein when she swifts, but today she was unstoppable! My favorite LYS owner is quite awesome to btw, he reads to Bug if there aren’t customers in the store, he knows what I like and leads me to new things that I might be interested in, and as I asked the cashier if she could look up which colors were discontinued so that I could trade skeins, he quickly stepped in to let me know that I could choose any of them for that price, even though they weren’t all being offered for that price. “She’s a great customer” he told the cashier. I suppose all this means is that he is a good salesman, which I knew, but he has an absolutely wonderful knack for making everyone feel special in his store, and that knack rubs off on the other workers, making for a wonderful LYS experience!